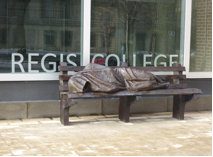 Recently, a prominent theological college at the University of Toronto unveiled a powerful work of art that got some attention, both on a local as well as national level. The piece is called ‘Homeless Jesus’. It is a life-sized bronze statue that portrays a figure lying huddled under a blanket on a park bench. The artist only identifies the figure as Jesus at his feet, which bear the marks of the crucifixion. The statue is very moving, and is a sobering, beautiful reminder to passersby of how Jesus would likely be living if he were with us today in our city. With the image on my mind one morning, I went looking for Greg, a friend of mine and a participant in our drop-in meal program. Greg is incredibly bright; an intellectual through and through. He visits University of Toronto lectures on a semi-regular basis, and knows more about theology than just about anyone. Also, Greg has experienced his own story of homelessness. Greg was on the streets for many years (though thankfully, he’s currently off the street), and has experienced first hand addiction treatment programs and supportive housing facilities. Generally, a conversation starter such as this one would solicit a well formulated, thoughtful response from Greg. He is a socially-conscious theologian and art lover. He was even recently at the lecture that unveiled the statue. I expected to hear a few minutes of insight into the piece’s creation or some gleaning of the lecture discussions. I settled in with him near his seat, and prepared myself for a thoughtful and insightful reply. Not one to make flippant remarks or dismiss important works of art, I processed his response. The point Greg was making was that it’s not a matter of ‘either/or’; the art is significant and sends an important message to its viewers. But Greg reveals to us that a regular bench should be seen as just as powerful and beautiful as this moving piece of art, for it too calls for celebration. A bench in itself could be, to some, one of their only places for healing, rejuvenation, and rest. When it may feel like the world is pushing away, the bench welcomes all. While the sculpture calls us to hospitality, the bench actively offers it. When I first moved to Toronto, I started a job working at a homeless youth centre. A few of us were invited to be ‘homeless for a weekend’, an experience that was offered by the organization to new staff who wished to participate. For me, the most powerful revelation during the experience was learned at about 6 am one morning, alone, after a night of walking. I had slept a total of about one hour on damp grass. My stomach was full but uneasy… all I had eaten were the free end-of-day doughnuts that a Coffee Time clerk had offered my co-worker and me with a look of pity at 3am. I remember being so tired and sore, but also very tense and alert at the same time. I looked across the street and spotted the back of an empty park bench. It was a beacon of light to me; like a luscious water hole in the middle of a barren desert. Sweet, wonderful bench, you are a gift from God! I thought. The only thing I could think of was getting to it and resting my weary bones. But when I reached it, I realized something about the bench that quickly deflated the little hope I had left of getting sleep. And then, I went a little crazy. ‘NOOOOOO!!! !’ I had lost myself in the moment, and literally screamed so the few people in the park could hear me quite clearly. I fell to my knees in defeat. The park bench had ARM RESTS. But not just on the ends, there were two, evenly spaced, right in the middle. At any other moment in my life, I would have thought this was just a lovely little bench with character, featuring additional convenient arm rests for multiple people to sit and enjoy. But in that moment, I had a dark realization that these arm rests were placed strategically, likely for the sole purpose of preventing the homeless from laying down comfortably on them. Sounds paranoid? Defeatist? Delusional? I would argue that it was actually a moment of obscene clarity. And in that moment, I hated the world. I hated the city for ordering these benches, to ensure they were comfortable but not too comfortable for the wrong people. I even hated the manufacturer that created them. The bench was sending me a message loud and clear: I was not welcomed here. The bench had won, and left me hopeless and discouraged, with nothing else to do than to continue on my tired way. Luckily, my hatred towards this bench and everyone involved in its creation slowly died after I got some sleep. And now, I see park benches to act as my own personal covenant. For Noah, it was a rainbow. For me, God promises with the sign of a park bench that I am being loyal to my calling when I pursue working towards justice and demonstrating love to my neighbour--especially to the poor--in my midst. Yes, all that from a park bench! I believe we are all born with our own gifts, our own areas of interest and expertise, and our own unique personalities. We are not all called to do the same thing with our lives, in fact, that would be quite boring! I believe we are called to bring light into the worlds we find ourselves in. One example that comes to mind is of an introverted biology student that volunteered with us several years ago. After getting to know some people outside of his own circle within our space, he learned that many people in this city are not getting access to enough healthy food. And at school, he was realizing that many students were not using their entire meal plans they purchased, and letting them go to waste. Putting two and two together, he organized a group that now organizes sending thousands of bagged lunches to local drop-in programs, all sourced from students donating the extra money they had on their meal cards. About 200 students participate in bagging the lunches each year, and hundreds of students donate to the program on a monthly basis. Our program is still receiving the fruits of his labour from many years ago. All from an undergraduate biology student, who allowed himself to see through different lenses within his everyday world. We must be careful to not let ourselves get so deep into our own worlds, responsibilities, and roles that we miss the point entirely. If our words and our actions don’t ultimately meet with humanity, they are useless. But when they collide, when we have the poorest in mind in our work, in our infrastructures, in our words and in our studies, we are moving towards hope and participating in justice. Perhaps our first step to connecting with the poor amongst us is simply to pray for eyes that see things differently. Sometimes all it takes to create life-giving change starts with allowing seemingly simple realizations to stir within us deeply. We will begin to notice things beyond ourselves, and to allow ourselves to feel a little uncomfortable. Who knows, something as simple as a park bench might awaken in us nothing less than the Holy Spirit. Angie Hocking is the Outreach Coordinator of the Drop-In Meal Program at Church of the Redeemer in downtown Toronto, which focuses on creating space for healthy community within the homeless and marginalized local population. If you live in the area and are looking for a way to connect with a drop-in community, or simply want to experience making some new friends outside of your everyday sphere, please get in touch with Angie at hockinga@theredeemer.ca. There is room for all at our table! Angie, thanks for sharing your story of Greg and the park bench and for revealing the ways in which the everyday conspire against vulnerable people in real ways. This writing is beyond excellent! Thank you everyone, for your interaction with this reflection and for your kind feedback. Very moving, Angie, and wonderfully expressed. I'm a facebook newbie and I had 'liked' ICS soon after, of course, but wasn't getting any notifications. Have now signed up for that, and your gem made it worthwhile. Thank you!